The Maccabeats, originally formed in 2007 as Yeshiva University’s student vocal group, have entertained and inspired hundreds of audiences worldwide, from Alabama to (New) Zealand and everywhere in between. 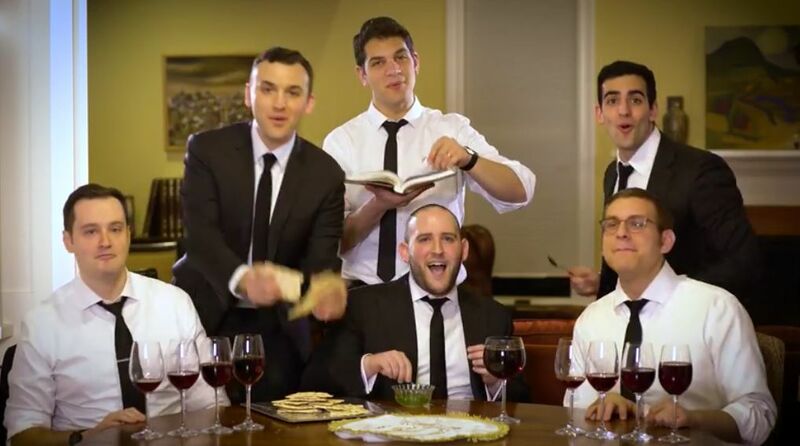 With the release of their latest music video for Passover, the Maccabeats have added a new twist to a cappella. They still don't use musical instruments, but include sound effects from the seder table -- wine glasses filled to different levels to produce different notes, a Haggadah with pages ruffled to make sounds, a bowl of karpas to make a dipping sound, and matza to provide a crunch. Pesach is almost upon us. Tomorrow's Joke to Start the Week will have a Pesach theme, and then we'll be taking the first two days of Passover off to spend time with our family in Jerusalem, returning with more Jewish Humor on Thursday. This looks like a lot of fun. i will try it with water.